The Motor Vehicles Act of 1988 makes it mandatory for all vehicles in India to have a third-party liability policy. This essentially means that riding a two-wheeler without an insurance policy can attract a penalty. Thane, which has seen a surge in its vehicular population over the last few years has a sizeable number of two-wheelers, with accidents on the roads a common feature here. Please note that the names listed above are not ranked in any specific order. Most insurance companies partner with local garages to simplify the process of getting a damaged vehicle fixed. Customers can avail the benefit of cashless service at these garages, with it possible to locate the nearest cashless garage in Thane by using any of the following means. The welcome kit provided by the insurer could contain a list of all network garages in the city. The official website of the insurer can be used to find the closest cashless garage. Alternately, one can also search the app of the insurer (if applicable) to get details of all network garages. Customer care representatives of the insurer could be contacted to get details of all network garages. In case the policy has been purchased from an agent, one can call him/her and ask for information pertaining to network garages. Utilising the services of a network garage can be advantageous in a number of ways. Hassle-free – Getting a damaged vehicle repaired at a cashless garage is hassle-free, with the insurer handling most of the formalities on behalf of the customer. One is expected to intimate the insurer and provide a few basic details to initiate the process. Quick – Most network garages will service and return the bike within a specified period of time. This is unlike other garages, which can drag on the service for days. Quality – Network garages come with the assurance of quality. One needn’t worry about the quality of products used, for these centres uses genuine spare parts. Limited spending – A customer might not end up paying money from his/her own pocket when he/she gets the damaged vehicle fixed at a network garage. The bill is settled directly by the insurer. Payment might be required when the bill amount is over and above the cover provided by the policy. Additional services – Most network garages provide services like pickup and drop of vehicle, towing, roadside assistance, etc. Replacement vehicle – It is possible to get a replacement bike while the damaged vehicle gets fixed at a network garage. This could vary from case to case. Expertise – Network garages employ expert mechanics who are capable of fixing problems which local garages might not be able to solve. This can be extremely beneficial in case of imported/high-end bikes. When it comes to a bike insurance, most of us end up purchasing it just for the sake of government regulations. Considering a few points before we buy the policy can be extremely beneficial in the long run. Type of cover – There are two options when it comes to buying a two-wheeler insurance policy: comprehensive package and liability-only. While the liability-only policy meets governmental requirements, it offers limited protection. A smarter option for those residing in populated areas which are more prone to accidents would be a comprehensive package. Plan cost – One is expected to pay a premium amount towards the upkeep of the policy. The premium varies according to the city where the vehicle is used/registered, make and model of bike, age of bike, engine capacity, etc. Discounts – One can reduce the premium amount by keeping the vehicle accident-free. The No-Claim Bonus (NCB) helps bring down the premium, with insurers offering NCB to the tune of 50% in certain cases. Claims process - Ensure that the chosen insurer has a simple and efficient claims process in place. This can be extremely beneficial during an emergency. Inclusions/exclusions – Each policy comes with a list of inclusions and exclusions. Common exclusions include using the bike while intoxicated, using it for commercial purposes, etc. While the exclusions are standard across most insurers, one should have a closer look at the inclusions to ensure that the vehicle is protected in most scenarios. Policy term – One can choose a policy term based on his/her needs. Insurers offer policies with a period ranging between 1 year and 3 years. Opting for a longer period can help reduce the premium cost and is becoming a popular option among many residents. Network garages – Opt for an insurer with a presence across the country. A large number of network garages can simplify the process of getting a damaged vehicle repaired. 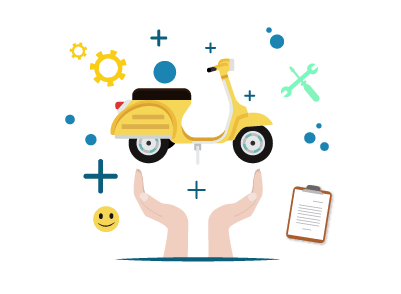 In case one sells his/her two-wheeler to an individual from another state, it is important to transfer the insurance policy to the new owner. An insurance company can reject a claim if there is a mismatch between the details of the owner and the owner of the policy. Transfer is possible by completing a few simple steps. The seller should get in touch with the insurance company, stating the decision to sell the bike. He/she will be expected to provide documents pertaining to the policy and the bike. These could include the registration certificate, NOC obtained by the RTO, sale deed, etc. The buyer will have to submit his/her personal details to the insurer. The insurer will transfer the policy once all formalities are done. One must remember to collect the NCB certificate in order to avail the benefits of the accumulated NCB before they transfer ownership of the insurance policy.